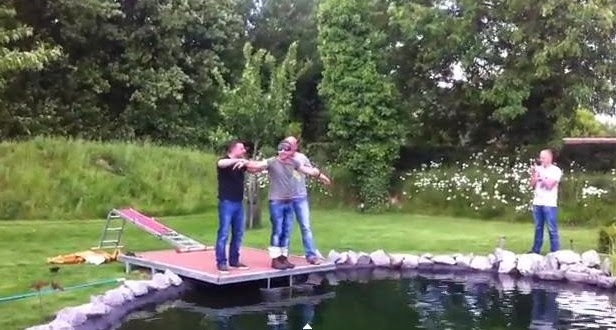 The hilarious stag do clip has gone viral as the groom-to-be psyches himself up before eventually being thrown in by pals It's a bit more original than tying the groom to a lamppost - these stag do pals engineered a prank to remember by tricking their mate into thinking he was bungee jumping. The friends blindfolded the stag and tied his legs together before leading him to the edge of a platform - which he believed to be hundreds of feet above the ground. The groom-to-be is seen psyching himself up for the big jump before eventually being pushed from the platform by two of his pals. But he is left visibly shocked when just a split-second later he hits the water face first. The stag party then erupts with laughter as the victim of the elaborate prank takes an unexpected swim.